The other day I talked about the list of grant monies that the city presented to the media. Specifically I posted information on some of the police department grants Laredo received in 2011 and 2012. Today I wanted to go over the money that the airport received. By doing so I hope to draw attention to the city's insistence on traveling to Washington D.C. every year in large numbers to lobby for money, when in fact, these grants are consistently there. It makes no sense for them to take such a large contingent over there year after year. The partial list pictured appeared in the LMT, courtesy of the city. In 2011 the city got over $1.6 million for EMAS work. 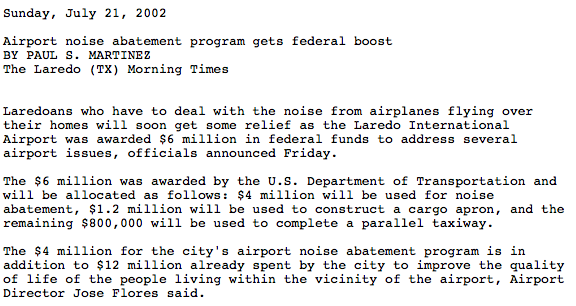 Here's the same funding from back in 2005, pre-Raul Salinas and Carlos Villarreal era. So the mayor, city council, and city manager can talk all they want about the importance of going to D.C., and they can give themselves $40,000 raises, and have outrageous phone allowances, but I'm not impressed by what they say they do. 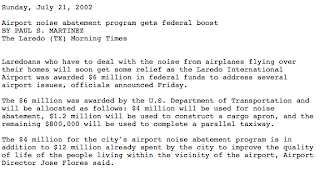 Maximiliano at LaredoTejas blogged about how the city's entourage got so big in recent years. Can you believe only five people went to D.C. in 2006?